Kerala: July 27. Delhi: August 3, 2018. It’s not what you are thinking. Maradona is not a sports flick. 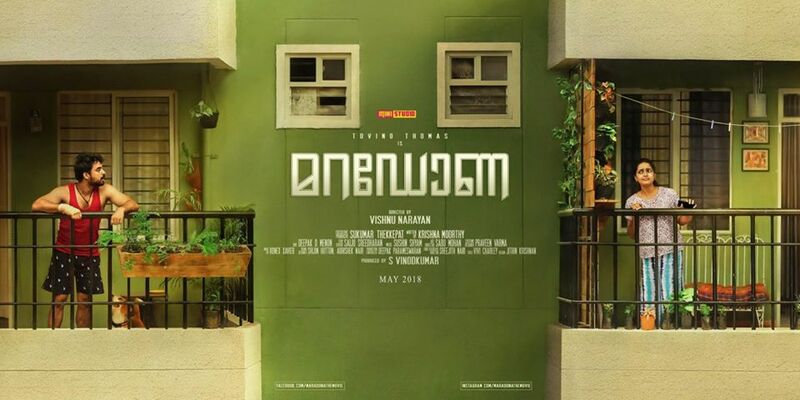 The title comes from the name of the small-time criminal played by Tovino Thomas in this new Malayalam film release. Maradona and his friend Sudhi (Tito Wilson) are on the run from a bunch of brutal hitmen led by a fellow called Martin (Chemban Vinod Jose). While one of them holes himself up in a hotel room, the other finds refuge in the Bengaluru home of distant relatives (Leona Lishoy and Jins Baskar). Stuck in that flat in a high-rise building in a massive housing complex, Maradona at first experiences intense loneliness, a foreign feeling that drives this callous man to seek out fresh relationships in an alien world. Hundreds of kilometres away, in Kerala a senior politician is preparing for a crucial election. His son Aravind (Shalu Rahim) lies in a hospital with a life-altering head injury, and silence around the boy’s condition is of essence for the neta’s career. He is, however, determined to find the people who reduced his child to this state. As debutant director Vishnu Narayan takes his time to unveil the events that brought matters to this pass, he centres his screenplay around Maradona’s coming of age. The story of Maradona by Krishna Moorthy has been modelled somewhat on the lines of Aashiq Abu’s Mayaanadhi (2017), which also starred Thomas. That film was about a gangster on the run who is desperate to convince the woman he loves to remain in her relationship with him. It was soulful, poetic and convincing. Narayan and Moorthy manage to marginally replicate Mayaanadhi’s tonal quality, but their plot is not as credible. They operate on the premise that human warmth can change the worst of men for the better. Fair enough. However, for one to believe that Maradona evolves because of the friendships he finds unexpectedly in that impersonal ocean of apartments, it was essential for the film to establish that his earlier life was bereft of all such bonds. But it is not. It is clear from the start that Maradona and Sudhi are joined at the hip and willing to risk life and limb for each other. What then is the difference between that equation and the ones that develop in the present day in that housing compound? The answer: nothing apparent. Maradona expects us to buy into the hero’s conversion simply because it tells us he is converted. But why should we? He was a jerk a moment before he metamorphosed into a non-jerk, good co-existed with evil within him (read: his great love for Sudhi versus his nastiness towards the rest of humanity) a moment before he became an all-round Mr Nice Guy, but with an unconvincing in-between the metamorphosis is just not believable. What works in Maradona is the protagonist’s chilling behaviour in his before story filled with acts of meanness and violence that, significantly, do not involve bloodletting. Nothing betrays the hardness of a human heart better than harshness towards kids and harmless house pets – through Maradona’s behaviour towards child and beast, Messrs Narayan and Moorthy establish the man’s utter amorality. Thomas is wonderful in those scenes. He is also a good casting choice because his urbane outward appearance and natural charm make you want to like his character until the narrative reveals how unlikeable he is. All is not lost though. I loved Sushin Shyam’s ominous background score for Maradona, and Sabu Mohan’s art direction, especially the film’s colour scheme. Conventional cinema tends to equate the big city with inhumanity while painting the countryside as an idyll where innocence and decency dwell. Narayan turns that trope on its head by setting Maradona’s goriest scenes in thickly vegetated seemingly remote locations while placing the central character in an urban jungle as he journeys towards self-discovery. The forest where men are seen being beaten to pulp is a delicious deep green, the brick-and-cement cluster where Maradona becomes a better man is a soothing, ice-cream-like lime green. Often in that urban agglomeration, Maradona is shown standing on a balcony or a terrace rooftop from where cinematographer Deepak D. Menon pulls out further and further and further, until the man is a disappearing dot on the camerascape. It is a captivating device that elevates Maradona’s atmospherics and thoughtful air – until it gets repetitive. As the titular character, Thomas is the fulcrum of Maradona and justifies every second of screen time given to him. The young actor is growing with each film. Tito Wilson is excellent but gets too little space here. Hopefully it will not take long for Mollywood to realise that U-Clamp Rajan from Angamaly Diaries is hero material. Sharanya R. Nair who plays Maradona’s neighbour Asha has an interesting screen presence, but it is worth asking why film after film in Mollywood persists in casting newcomers as female leads instead of seeking out established names as they do for male leads. Leona Lishoy – who appears as Nadiya, in whose house Maradona takes shelter – is an example of a woman actor with an impressive on-screen persona who is repeatedly given character roles and supporting parts because for decades now, Mollywood has rarely allowed women to build up substantial filmographies as leads. That is a separate discussion and one worth having. For the moment though, let’s talk about Maradona, a gangster flick with a difference that is mildly engaging but fails to live up to its own promise.